The holidays are a time to gather family around the table for quality time. As I get older, when the holidays come around, the emphasis on family is more important to me. For as long as I can remember, we have had a set menu for Christmas: ham, lamb, potato salad, green beans, macaroni and cheese, rolls, pineapple upside down cake, apple pie and gingerbread with lemon sauce. The preparation may change (I made lamb ribs one year and melted our outdoor grill) but the menu never changes, not even if we vacation away from home. This year, I'm going to add a little something special to our holiday meal. The Sunday Supper family is partnering with one of our favorite families, Gallo Family Vineyards, to share recipes, ideas, and inspiration for pairing the new Gallo Family Vineyards holiday wine blends with memorable holiday meals and traditions. Take one of the the best parts of Christmas dinner– sweet glazed ham fortified with rich red wine–top it with a rich, flavorful gravy and you have all of the makings of a new twist to a family classic. What makes your holidays so memorable? Red-eye gravy is typically a thin sauce often seen in the cuisine of the Southern United States and associated with country ham. The gravy is made from the drippings sausage, country ham, bacon, or other pork, sometimes mixed with black coffee. The "red-eye" part supposedly comes from the ring of grease in the pan when the gravy is finished, but I think it's from the fact that coffee is used to deglaze the pan and make the sauce brown. In this version, I use coffee to fortify the full-bodied, velvety richness of the Gallo Family Vineyards Red Berries & Chocolate Wine. Preheat oven to 350°F. Remove any packaging or netting from the ham. Trim away any excess fat, leaving about a 1/4-inch layer all over. Line a baking sheet with several sheets of aluminum foil and place the ham, cut side down, on the baking sheet. Tightly cover the ham with aluminum foil and bake for 45 minutes. When the ham is ready, remove it from the oven and increase the oven temperature to 425°F. Discard the foil. Pour the glaze over the ham and return it to the oven. Bake uncovered for 55 to 60 minutes total. Let the ham rest 15 to 20 minutes before slicing. In a small saucepan, warm drippings over medium-high heat, and then add the onions and garlic and cook until softened, 2 to 3 minutes. Once the onions are cooked, add the coffee and wine and allow the liquid to come to a boil. Add 1 tsp water to cornstarch to make a slurry. Pour it into the saucepan and whisk vigorously. Once the gravy thickens and can coat the back of a spoon, season with salt and pepper, to taste and remove from the heat. Use the whisk to stab the butter and slowly swirl it into the pan, to finish the sauce. Hold warm until time to serve. 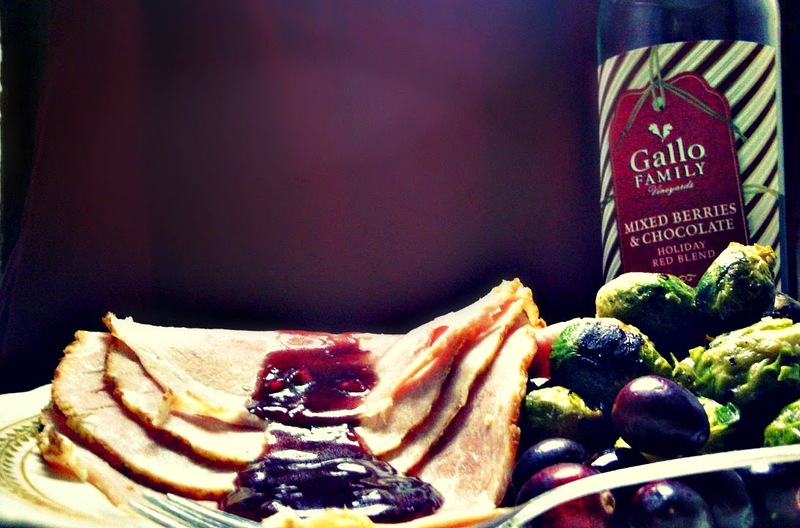 To serve Gallo Family Vineyards wine at your holiday feast, click HERE to find your own bottle or two. After you've located your local vendor, click HERE for a $1 off coupon. Connect with Gallo Family Vineyards to help you plan your own holiday celebrations. Compensation was provided by Gallo Family Vineyards via Sunday Supper, LLC. The opinions expressed are mine, and are not indicative of the opinions or positions of Gallo Family Vineyards. I don't know why we don't have ham more often...it seems like it just shows up on our Easter table, but I'm rethinking this tradition as your red-eye gravy looks incredible!!! Okay I have to admit that I've never been a fan of red-eye gravy but this one, wow!, it is one I know I want to try and have a feeling I will love! Wow! I'll bet the complexity of your gravy with the coffee and wine is amazing! I wish I had a big plate of your ham and red eyed gravy right now! What a great dinner! I haven't made ham in a long time! You inspired me! Wow! This looks wonderful. I love the glaze, and the red-eye gravy looks fantastic, fruity, and bright. Perfect with the ham!!! We will be having ham this year and I am making your gravy. That gravy...just get me a STRAW! 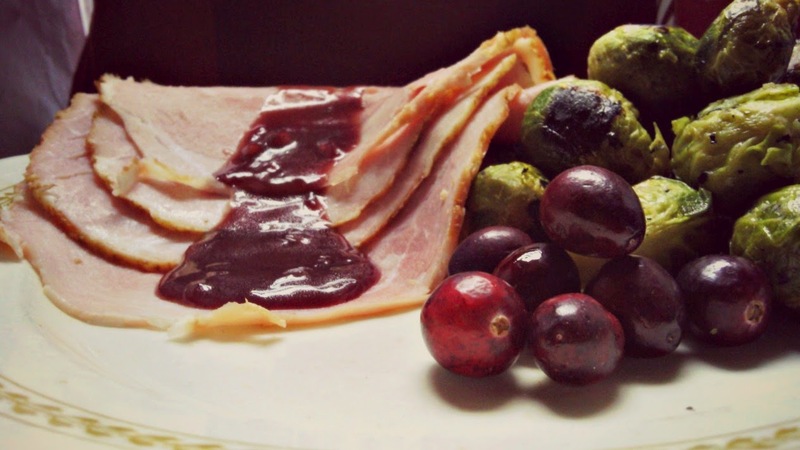 I love ham at the holidays and have never made red eye gravy, so I am pretty sure this will be happening this year!! Red Eye Gravy is on my list of things to try, and the addition of this wine sounds amazing! A good ham recipe is just what I've been looking for and don't even get me started on that gravy! Oh my yumminess that sounds perfect!! Talk about taking a ham to the next level for the holidays! So glad you shared this during #SundaySupper and I can't wait to try this recipe. I like that you keep a traditional menu but switch it up a little. Red Eye Gravy just got kicked up a notch! I love ham w/ redeye gravy, though I haven't had it in years. The wine is a fun twist! Oh my goodness - that gravy looks amazing! And the wine...I've got to try that! First time I am hearing of Red Eye Gravy, the flavors sound delicious! 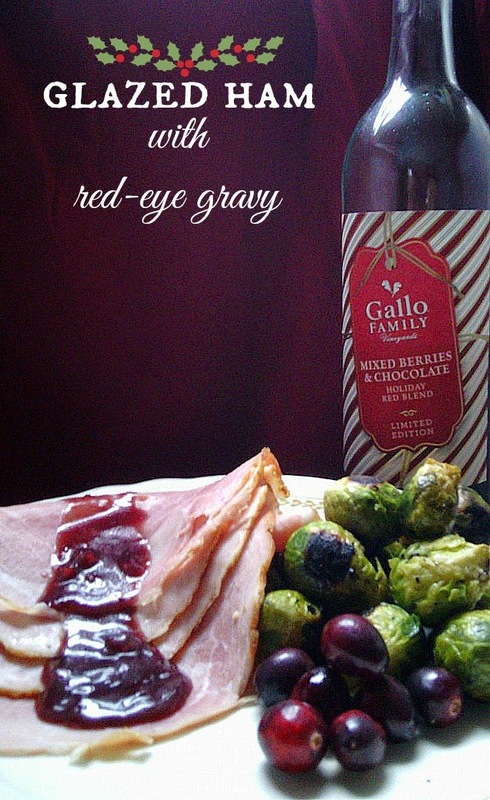 Ok - I've never heard of red eye gravy either but that wine alone sounds fantastic! We do ham every year for Christmas too but I usually jut serve with Dijon mustard - will have to try this out. It's so true that the emphasis of family during the holidays becomes more and more important as we get older. This looks like a wonderful gift to share with your family. I've heard that red eye gravy is all sort of awesome, but I have yet to try it. This reminds me that I should! What a beautiful red luscious color in that gravy! I might try this for Christmas. I'm hosting this year. Love the gravy! I think it's time to get my glaze on. This looks SO good! We don't have ham that often either, but we might have to change that for some red-eye gravy! Now that's a spin on red eye gravy that I can get behind! I always think of ham for Easter, and I love all the meals I get out of the leftovers. Maybe I'll have to rethink ham for Christmas, too. That Red Eye Gravy looks crazy good, Nikki! It is the perfect, luscious addition to a juicy ham!! This berries and chocolate wine would put red eyed gravy over the top! Wow! That glaze!! This is beautiful! I haven't tried red eye gravy but it's on my list of things to do. It looks marvelous on that ham. I've never heard of red eye gravy, but this sounds delicious. And that wine! YUM. Ham is my most favorite Christmas food. Even more than cookies. But I wouldn't want to eat it this year without a big slathering of this gravy! Red eye gravy is hands down my favorite! I'm a fan of most recipes with wine. This look divine! I'm a huge fan of ham and this Red-eye gravy looks like the perfect pairing!